Lorraine Higgins. Photo:- Mike Shaughnessy. This is the view of Labour’s Lorraine Higgins, the Athenry based senator who is seeking one of the four seats in the Midlands-North-West constituency in next month’s EU Parliament elections. Sen Higgins is one of only two Galwegians in a constituency that is home to such veteran MEPs as Fianna Fáil’s Pat ‘The Cope’ Gallagher, Independent Marian Harkin, and Fine Gael’s Jim Higgins and Mairead McGuinness. She must also face the challenge of one of the Dáil’s most colourful and controversial deputies, Luke Ming Flanagan. Midlands-North-West covers the disparate areas of Connacht, the three Ulster counties in the Republic, and the northern half of Leinster. Against the sitting MEPs and the strong challenge of Sinn Féin’s Matt Carthy, Sen Higgins needs to poll close to 20 per cent to take that final seat. Recent polls showing Labour at eight per cent nationally is “disappointing”, the senator acknowledges, but she also sees it as a spur to “get out there, work hard, and get the message across”, for “when your name is on the ballot paper, and people recognise it, that gives you a boost”, and in an election, transfers are key. Why Europe though? 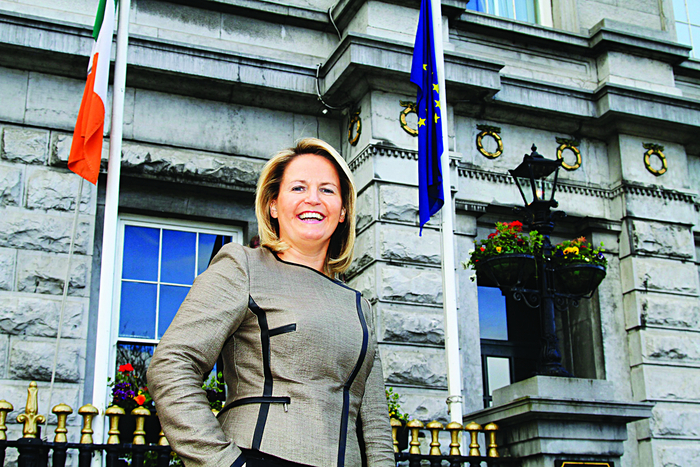 Given Sen Higgins’ elevation to Seanad Éireann after the 2011 General Election and her positioning to become Labour’s chief candidate in Galway East in 2016, opting for the potential wilderness of the EU Parliament seems a strange choice. “I’m running because the EU is incredibly relevant to our daily lives,” Sen Higgins says, “be it with the economy and the bailouts, and with issues such as cutting turf, having a septic tank, and with the recent flooding. Economic recovery, youth unemployment, and bank legacy debt are the three main platforms of Sen Higgins’ election campaign. Yet these three issues appear more relevant for national government and the Oireachtas, than the EU? Few would disagree, but Angela Merkel, the German Chancellor and one of the most powerful figures in the EU, is committed to the austerity agenda, and in the Fine Gael leadership and An Taoiseach Enda Kenny (who are fellow members of the European People’s Party ) she has staunch allies. At home and abroad then, Ireland - despite recent claims of the beginnings of an economic recovery - looks set to endure more austerity and the further squeezing of money from already hard pressed tax- payers. In discussions on the EU, the question regularly comes up, ‘Does the EU/IMF/ECB care about how ordinary people have suffered during the recession?’ At best, the likely answer is ‘No’. This is underlined by the fact MEPs cannot propose, initiate, or repeal legislation. This is a serious concern, especially when 65 per cent of our laws now come from Brussels. “I disagree that the Parliament is toothless,” says Sen Higgins. “Under the Lisbon Treaty the powers of MEPs have expanded to take in debates on the EU budget and taking part in these debates is a pathway to change legislation. A further problem for MEPs remain that on average, over their five year term, only 60 minutes is spent speaking in parliament. Should she be elected, it will be hard for Sen Higgins to get her voice heard.